'Sundown' by Stephen Gray. Medium: ink glazes. (Hung below at the exhibition). 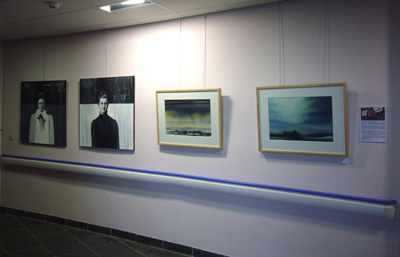 Above: two paintings by Rona, left, and right, paintings by Stephen. These are on the ground floor reception and cafe area. To the right of the photo are double doors leading through to the ward where there are a further eighteen paintings. Upstairs from the reception area a further five paintings can be seen on the curved wall. 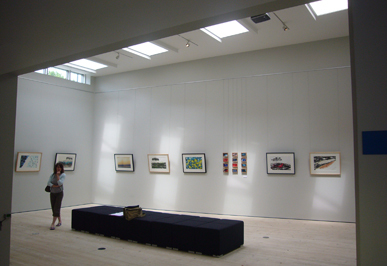 View of the 5th Anniversary Show, 03 Gallery, Oxford Castle, July 2011. To celebrate its 5th Birthday the O3 Gallery brought together a selection of the most exciting artists working in the South-East region today. 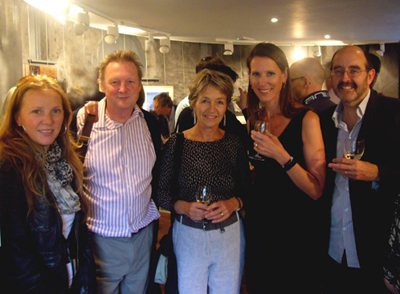 All artists participating in the 5th Anniversary Show have exhibited in the O3 Gallery at some point during its five year history, and they returned on this special occasion to each present a piece of new work. 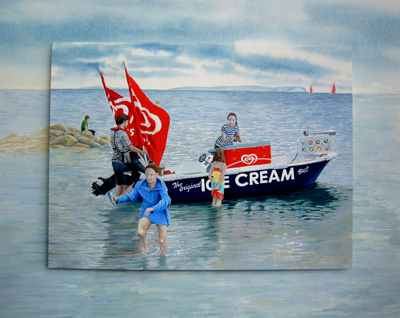 out to the boat to buy an ice cream or lolly. Painted with gouache and artists' water colour. Image size 290 x 230mm in a beech frame. SOLD. 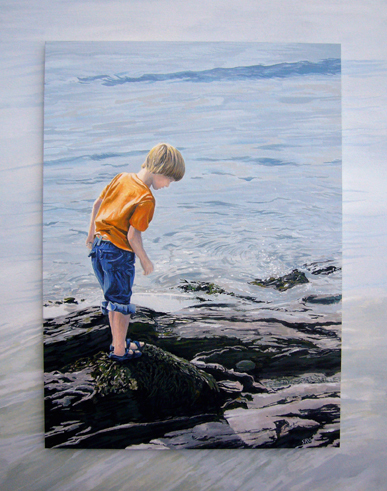 I spotted my son, lost in a world of his own, rockpooling at Looe in Cornwall. I did wonder how long that wonderful age of innocence would last. 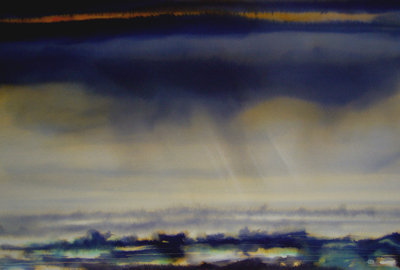 Treescapes and the River Thames is an exhibition of Stephen Gray's ink and watercolour paintings at Cornerstone Arts Centre, a series of thirty paintings that explores the countryside and waterways around where he lives in Oxfordshire. This series of paintings takes as its theme a circular riverside walk between Culham and Sutton Courtenay, offering observations and impressions of the landscape. Rather than a literal interpretation, the paintings explore the sense of space around and along the river, presenting a response to what it feels like to be part of the changing seasons. While the larger paintings take the river as their theme and offer a glimpse of the walk itself, the smaller paintings show rather more of the medium itself: ink and water on stretched watercolour paper. These smaller works are experiments with the technique, study pieces that explore the flow of the ink on the surface and often suggest a landscape or mood that is then developed into a larger work. "The starting point with my painting, from the conceptual process through to the finished work, is influenced by location and the medium I'm using," Stephen said. "This series is largely influenced by being out in the country. I have always been a country boy and I still live by the river, walking in the fields every day and enjoying the changing views through the seasons. These are landscapes inspired by these experiences but the particular technique of ink on paper I have used in this series is as much of a theme as the trees themselves." "I was reminded how very simple good work can be," he said. "It made me realise that a lot of my paintings are quite highly worked and I felt that I wanted to strip it back, to work as simply as possible. I started to experiment with ink on watercolour paper and I found a distinctive reaction - a sort of secondary ochre - when the two come together. It is an unpredictable reaction and it gave me a freedom to work in a new way." "For me it is unusual to be working with the unknown. I am used to knowing exactly the effect I am trying to achieve so it has been quite a challenge to work with this very loose approach. The time on the paper is very short and the work is done in one take. The consideration of how it might look runs through my mind, like a form of mental rehearsal, before I start but the unpredictability of the technique means that one cannot be tentative. I found that I had to work quickly and that problems only arose when I started thinking about it too much. The dried result is very different to the first-finished work but I quickly discovered that I had to walk away from a painting and not revisit it, that the first image is the only one that matters." Many of the paintings in this exhibition demonstrate this particular approach but the work on display also shows how the technique has developed. Still working with ink but also with water colour and gouache, Stephen has refined the technique, finding more detail and allowing a greater degree of structure in the paintings. "There are elements of the free-flowing approach I first found with ink on a brush in these most recent works but there is not necessarily the same spontaneity across the whole painting. These later paintings show an exploration of a particular technique and offer a counterpoint, rather than a repetition, of the original style. I hope people will enjoy seeing them." Very beautiful, peaceful and contemplative, beautifully framed to compliment the pictures. 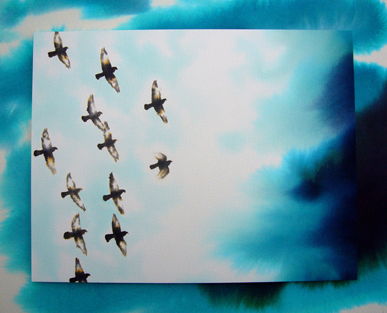 I like the way the ink runs and blends with the paper which gives movement to the pictures . Breathtaking! a wonderful selection of paintings with pure colours. Strikingly effective, will recognise in the future. Refreshing to the eye. Lovely exhibition. Really gives a feel of his subject. Absolutely fabulous - wonderful open quality. Fantastic! I know the walk well - brings back childhood memories of summer days. I thought the pictures were amazing! beech frame. For sale £220.00. 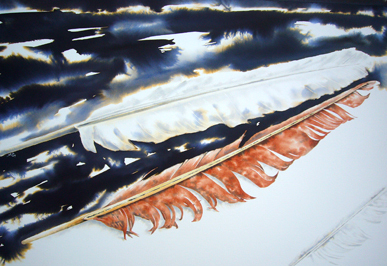 'Swan feathers' is for sale - see 'Paintings' link on the top menu. Stephen Gray spoke and demonstrated his ink style and technique, shown above, to members of Didcot Art Society, September 2009.